Instead of denying your King. We pray you please to help us As His fair praise we sing! We lift our hearts in joyous song To honor Him this way, And while we sing, remembering, To sing is to doubly pray. With song to praise God twice, We ask dear saint, to help us be United closed to Christ! Cecilia was born in the early part of the third century, in Rome. Born to wealthy, pagan parents, she was likely instructed in the Catholic faith by kind relatives or a nurse. As a noble family—known for their bravery and intelligence—her parents were likely to have accepted (although possibly not approved) of her Catholic faith. By all reports, even as a child, Cecilia loved music, and she would spend her days singing the praises of God, accompanying herself on various instruments. Cecilia embraced the faith from childhood. Drawn to the Lord, she attended Mass daily, desiring nothing more than to embody the virtues of Christ: faith, hope, charity, humility, and purity. As a child, she consecrated herself a bride of Christ, pledging her perpetual virginity to the Lord. As there were no religious orders for women at that time in history (not for at least 200 more years! ), Cecilia was limited in her options. She fasted, prayed, and work sackcloth each day. While she spent her days in charitable works, caring for the poor and needy, her parents were searching for a husband for her to marry. They found an upright and honest man, Valerian, who was pagan like themselves. Cecilia was torn. Obediently, she wish to do as her parents bade her, but she had made a vow of virginity for the Lord. She spent her days and nights in prayer, offering herself to Jesus, fasting, and enacting harsh penances. As her wedding day approached she did little but pray… until the Lord sent comfort. The Lord promised to send an angel to Saint Cecilia, to guard her, and to assist her in keeping her vow. Cecilia was married in a lavish ceremony, internally, in her soul, becoming the bride of Christ. Upon hearing this, Valerian was at first surprised, and then slightly irritated (as one might expect!). "I am very surprised at what you are telling me and I wish to see this angel!" "You shall see him," Cecilia gently answered, "when you are purified." "How shall I become so?" asked Valerian. "Go to Pope Urban," she instructed him. "When you tell the poor that you are Cecilia's friend, they will take you to see the Pope. He will explain to you the mysteries of the Catholic Faith. May God bless you and my angel protect you." Valerian, for his part, was moved by the grace of the Lord, and traveled to see Pope Urban that very evening. He was converted to Catholicism and baptized into the faith. Wearing his baptismal gown, he returned to his new bride, finding her accompanied by the angel she had promised. The angel, as emissary from the Lord, bestowed upon them both the golden crowns of heaven. Together, they lived in celibacy, and grew in love for the Lord, eventually converting Valerian’s brother, Tiburtius, a man of some importance in Rome—who upon seeing their heavenly crowns was moved to accept Jesus Christ. Together the brothers made it their mission to find and provide a decent burial to the Christian martyrs being executed throughout Rome. It was not long, however, until word spread of their endeavor. The Governor of Rome, learning of their Christianity through Tiburtius, summoned the brothers before him. When questioned, they refused to recant their faith, stating: "We are Christians and we believe in Jesus Christ, the One and only true God!" Upon hearing this, the Governor ordered them martyred. 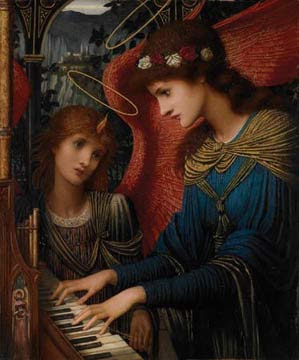 Saint Cecilia, assisted by her angel, recovered and buried the bodies. But soon, she was called before the Governor as well. Courageously, she, too, declared her faith: "I too am a Christian and I believe in Jesus Christ, the One and only true God!" The Governor was not furious. He sentenced her to death, stating: "Cecilia! You are condemned to die for loving the poor and for adoring Christ crucified!" But Cecilia was not to be harmed. The soldiers tried to scald and suffocated her in the steam bath in her own home, but rather than suffer, she could be heard singing to the Lord, seemingly accompanied by the choir of angels. After 36 hours, in which she should not have been able to survive, she was released. The Governor then ordered her head cut off, but the guard who attempted sliced her neck three times with a sword, but was unable to sever it. Scared, he ran away, leaving her wounded and in great pain. Cecilia survived for three days, bleeding and injured, but cared for by her angel and the Christians in the small community that had developed. During that time, she preached, converting many, gave away all that she had to the poor, and prayed incessantly. Many came to visit her, soaking up her blood with cloths and sponges, reporting miracles at her intercession later. On the last day of her life, Pope Urban traveled to her home, bestowing upon her the Last Rites, and seeing her to Heaven. On her wishes, Pope Urban ordered Cecilia's house converted into a church, with the steam bath—the site of the start of her martyrdom—the chapel. To this day, one can still see the pipes where the hot steam poured in, and the stone floor where Cecilia was struck with the sword. The mysteries of Saint Cecilia’s life did not end in death, but continued. After some years, a grand church was built in Rome to honor her. Pope Pascal I, who undertook to rebuild the church many years later, was troubled that the saints holy body had never been recovered. One Sunday, while praying in Saint Peter’s Basilica, Saint Cecilia appeared to him, consoling him, and declaring that he would find her body. Inspired by her words, a search was begun, and Saint Cecilia’s body was discovered, buried in a cemetery now named after her. Gold cloth wrapped the incorrupt body, and the blood-soaked linens that had bound her neck wound were preserved within the tomb. Nearby, the body of her husband, Saint Valerian, was also discovered. The relics of these saints were moved to Saint Cecilia’s Church in 821. The life of Saint Cecilia is one of great mystery, as we are left uncertain of the actual events of her marriage and martyrdom. What we do know, from Holy Legend, is that Cecilia was called by the Lord to devote herself to Him—in service to others, in practice of virtues, and in praise and music—all of which she did gladly and with abandon. 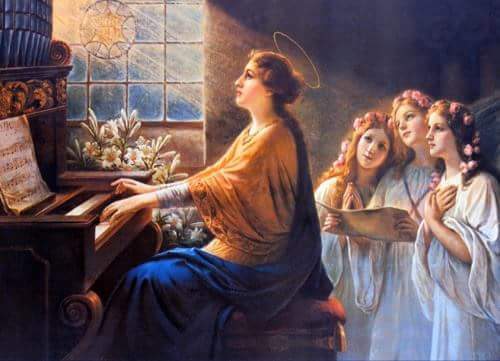 Despite many obstacles, Saint Cecilia remained pure in the eyes of the Lord, a heavenly instrument of His love on earth!